ECOPAC supply wooden crates to pack products as diverse as high value bathroom furniture, supermarket check-out systems and ATM machines. When you’ve got large, heavy, bulky items to ship bespoke wooden crates probably provide the most secure solution, especially if your goods are travelling a long way, are going to be in storage for a long time, or are being carried by a third party. 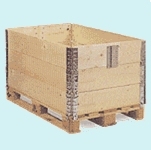 As most wooden crates are built around your products needs, contact our sales team to discuss your requirements.